hen Charles the Second was King of England, there lived in London a wealthy admiral of the British navy, Sir William Penn. He had been such a brave sailor that he was a favorite at court. He had a son who was a handsome, merry lad, whom he meant to educate very highly, for he knew the king would find some great place for him in his kingdom. So young William was sent early to school and college, where he learned Greek and Latin, French, German, and Dutch. He was quick motioned and strong. At Oxford College there was hardly a student who could equal him in swimming, rowing, and outdoor sports. His father grew prouder and prouder of his son each day. "William," he said to himself, "will do honor to me, to his king, and to his country." And he kept urging money and luxuries upon his son, whom he dressed like a prince. Imagine the Admiral's despair when he learned one morning that his son was hobnobbing with the Quakers! Just then a new sect of religious people who called themselves Quakers, or Friends, had sprung up in England. They were much despised. A Quaker believed that all men are equal, so he never took his hat off to any one, not even the king. The Quakers would not take an oath in court; would not go to war or pay money in support of war; always said "thee" and "thou" in addressing each other, and wore plain clothes and sober colors. They thought they ought always to act as their consciences told them to. In England and Massachusetts, Quakers were treated like criminals. Some of them were put to death. But the more they were abused, the more their faith became known, and the more followers they had. A traveling Quaker preacher went to Oxford, and when young William Penn heard him, he decided that he had found a religion that suited him. He stopped going to college services, declared he would not wear the college gown, and even tore the gowns from other students. He was expelled from Oxford. The Admiral was very angry. He told his son he had disgraced him. But he knew William had a strong will, and instead of having many harsh words with him, sent his son off to Paris. "I flatter myself," laughed the Admiral, "that in gay, fashionable Paris, William will soon forget his foolish ideas about the Quakers." The young people of Paris made friends with William at once, for he was handsome and jolly. He was eighteen years old. He had large eyes and long dark hair which fell in curls about his shoulders. For a time he entered into all the gay doings of Paris and spent a long time in Italy. So when he returned to England, two years later, his father nodded approval at the change in his looks and ways. He seemed to have forgotten the new religion entirely. But presently an awful plague swept over London, and William grew serious again. The Admiral now packed the boy off to Ireland. He was bound to stop this Quaker business. There was some kind of a riot or war in Ireland, and William fought in the thickest of it, for he liked to be in the midst of whatever was going on. One evening he heard that the old Quaker preacher he had liked at Oxford was preaching near by. He, with some other soldiers, went to hear him, and all his love for the Quaker faith came back to him, and he joined the society. He was imprisoned with other Quakers, and then his father said he would never speak to him again. But he really loved his son and was so pleased when he got out of prison that he agreed to forgive him, if he would only promise to take off his hat when he met his father, the king, or the Duke of York. But after young William had thought about it, he told his father that he could not make such a promise. William was sometimes in prison, sometimes driven from home by his father, then forgiven for the sake of his mother; often he was tired out with writing and preaching, but he kept true to his belief. When William's father died, he left his son great wealth, which he used for the good of others, especially the Quakers. William knew the Crown owed the Admiral nearly a hundred thousand dollars. As the king was something of a spendthrift, it was not likely that the debt would be paid very soon, so William asked the king to pay him in land. This the monarch was glad to do, so he granted an immense tract of land on the Delaware River, in America, to the Admiral's son. William planned to call this tract Sylvania, or Woodland, but when King Charles heard this, he said: "One thing I insist on. Your grant must be called after your father, for I had great love for the brave Admiral." Thus the name decided on was Pennsylvania (Penn's Woods). William Penn lost no time in sending word to all the Quakers in England that in America they could find a home and on his land be free from persecution. As many as three thousand of them sailed at once for America, and the next year William visited his new possessions. He did not know just how the tract might please him, so he left his wife and child behind, in England. He laid out a city himself on the Delaware River and called it the City of Brotherly Love, because he hoped there would be much love and harmony in the colony of Quakers. The other name for city of brotherly love is Philadelphia. If you visit this city to-day, you will find many of its streets bearing the names William Penn gave them more than two hundred years ago. Some of these are Pine, Mulberry, Cedar, Walnut, and Chestnut streets. Of course Indians were to be found along all the rivers in the American colonies. Penn really owned the land along the Delaware, but he thought it better to pay them for it as they had held it so many years, so he called a council under a big tree, where he shook hands with the red men and said he was of the same blood and flesh as they; and he gave them knives, beads, kettles, axes, and various things for their land. 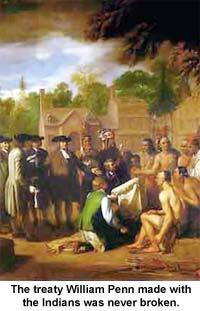 The Indians were pleased and vowed they would live in love with William Penn as long as the moon and sun should shine. This treaty was never broken. And one of the finest things to remember about William Penn is his honesty with the much persecuted Indians. Penn left the Quaker colony after a while and went back to England. But he returned many years later with his wife and daughter. He had two fine homes, one in the city of Philadelphia, the other in the country. At the country home there was a large dining-hall, and in it Penn entertained strangers and people of every color and race. At one of his generous feasts his guests ate one hundred roast turkeys. Penn, who was so gentle and loving to all the world, had many troubles of his own. One son was wild and gave him much anxiety. He himself was suspected of being too friendly with the papist King James, and of refusing to pay his bills. For one thing and another, he was cast into prison until he lost his health from the cold, dark cells. It seems strange that the rich, honest William Penn should from boyhood be doomed to imprisonment because of his religion, his loyalty, and from trying to obey the voice of his conscience. While he was not born in this country, the piety and honesty of William Penn will always be remembered in America.